On Friday the 11th May at 7.40 am, a phreatic eruption occurred Mount Merapi which sent a 5,500m column of volcanic debris into the air. In response to the activity visitors to the national park and residents were temporarily evacuated, the national park and local international airport were also temporarily closed. Merapi’s status was reconfirmed as being still at ‘normal’ levels later the same day, after which all residents were permitted to return immediately to their homes. WHAT IS A PHREATIC ERUPTION? A phreatic eruption is caused by the interaction of surface or ground water with hot magma. Due to magma’s extreme temperature, water is instantaneously evaporated which results in a explosion of steam mixed with surrounding debris of ash, rock and gases. WHAT ARE THE POTENTIAL RISKS OF PHREATIC ERUPTIONS? Phreatic eruptions are generally associated with much fewer risks than magmatic eruptions, and are usually only potentially fatal to those in close proximity at the time of the blast, i.e. less than 3km to the crater (due to the risk of being injured by large rock debris or poisonous gases), however the secondary risks include respiratory and skin problems as result of exposure to ash and debris. IS IT POSSIBLE TO PREDICT A PHREATIC ERUPTION? 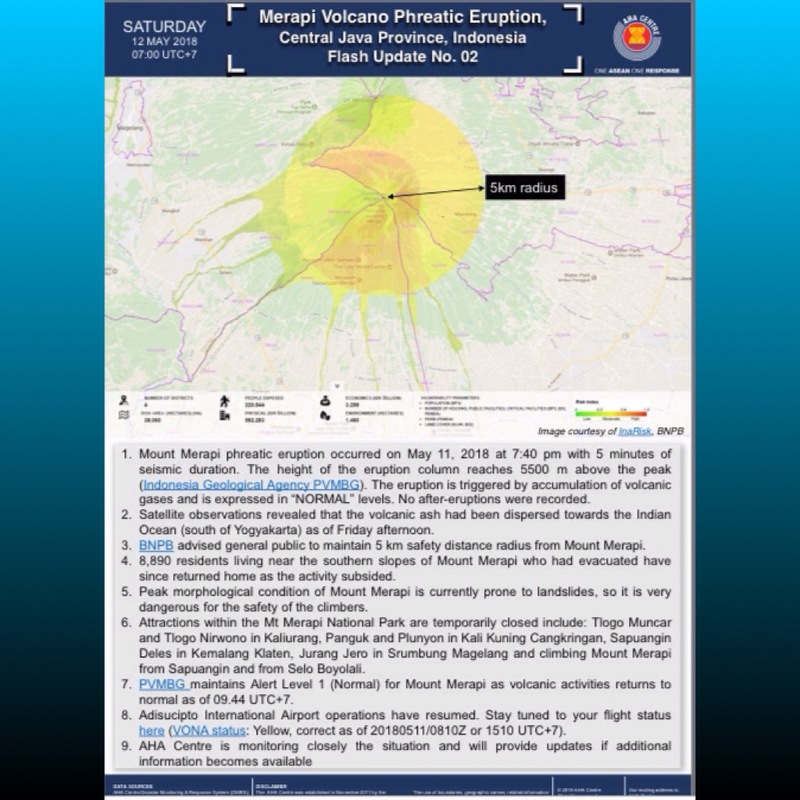 It is important to note that while the potential risks are much lower than magmatic eruptions, phreatic eruptions are hazardous due to their unpredictable nature as, unlike magmatic eruptions which can be accompanied by a slow and traceable increase in activity over many months, the onset of a phreatic eruption can be almost undetectable. HOW DID THE PHREATIC ERUPTION AFFECT THE COMMUNITY OF PANGUKREJO? In the event of any volcanic activity it is protocol for the community to prepare to evacuate to one of the largest relocation villages to the south east in a calm and orderly fashion. As this eruption occurred spontaneously and at the same time as the area was busy with many tourists from outside the area, this was made very difficult and dangerous due to major failings in the condition of the evacuation routes running through the the village, which led to the high number of traffic accidents and irresponsible driving that occurred on the morning of the 11th of May. WHY ARE THE EVACUATION ROUTES CURRENTLY INSUFFICIENT IN THIS AREA? Proper maintenance of the evacuation routes is currently prevented by the area’s status as a high risk level III area (Kawasan Rawan Bencana III or KRB III) which restricts funding for maintenance in several ways. First of all, there are no official signage of the evacuations routes meaning visitors and tour guides have no clear information to follow in the event of an emergency. Secondly, as the KRB III regulations prevent funds for road repair to be carried out in this area, the surface of the evacuation routes are in very poor condition and exacerbate the risk of traffic accidents in an emergency situation. Thirdly, many of the evacuation routes are also still being used as access routes for sand mining vehicles even though this is strictly prohibited. Finally, funding for training in for example evacuation drills or emergency procedure is not available for residents of this area. HOW DID IT AFFECT THE STUDENTS AND VOLUNTEERS OF SEKOLAH GUNUNG MERAPI? As our school is located outside of the 5km radius and the eruption occurred during our term holiday, all our volunteers and students were not affected by the eruption. On the 5th November 2017 we were able to assist our community in organising and performing an independent evacuation drill to prepare and increase awareness of what to do in the event of a phreatic eruption. As result of this preparation, during last week’s eruption our community were much better prepared and aware and helped where possible to reduce panic and chaos on the roads. WHO WAS AFFECTED BY THE ERUPTION? Although on the morning of the eruption both Merapi’s summit and highest view points had been full of nearly 200 visitors enjoying the sunrise on Merapi, most of the visitors had already descended by the time of the eruption and were thus safe from impact of any larger debris. Most injuries were reported as result of traffic accidents as civilians panicked on the road, aggravated by insufficiencies in the condition of the roads as stated above and a lack of awareness about phreatic eruptions and volcanic hazards in general.